Church School meets on Sundays before the worship experience between 9:30 a.m. to 10:45. Several classes are available to serve children through our senior adult class. For more information contact Sis. Brenda Hinton. ​Supports Christian outreach at the local, national and international level to address health, development, peace, and justice issues in partnership with other AME Church bodies. ​Food ministry to assist Carbondale community. 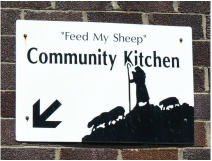 Volunteers needed for food preparation, meal serving, & clean-up. ​Serves Monday thru Friday 12:00-1:00 pm. Bringing God’s peace, perspective and purpose to today’s busy woman. Meets on 4th Saturday at 10am. 1.To create a love and appreciation of the History and Principles of African Methodism. 2. Keep the memory of Richard Allen alive. 4. Stimulate and Educate the Laity in the Total Program of the Church. 5. Study the Discipline and learn the laws of the Church. 6. Encourage Financial Support of the Church's Program. 7. Teach and Practice Stewardship and work with the Youth to teach them Methodism. ​​Evangelism Ministry-Outreach and teaching ministry that believes in and actively shares salvation by grace through faith in the Lord Jesus Christ.